Buying a greatest hits package for Neil Diamond is harder than one might think. Over the years, most have been littered with live versions or re-recorded versions of key tracks. So the search went on for many years. Now, usually I’d eschew Best Of collections in order to go straight to the actual albums but some artists lack a sure fire 5-star album. While boasting an arm’s length list of classic songs, you’re not going to see a Neil Diamond album in any Top 100 Greatest Albums lists. 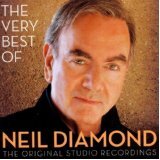 The first half of The Very Best Of Neil Diamondis a nearly flawless collection of pop, folk, and singer-songwriter stories. The run of tracks from “Cherry, Cherry”, “I AM… I Said”, “Sweet Caroline”, and “Cracklin’ Rosie” is sublime; 60s and 70s pop does not get any better than this. The dizzying heights continue as “I’m a Believer” and “Girl, You’ll Be A Woman Soon” appear soon after. One of the few new tracks to this writer is the Robbie Robertson produced “A Beautiful Noise” which, as the lyrics say, “has a beautiful beat”. The pacing/order of the tracks for the most part works like a charm. Many slower tracks such as “Love On The Rocks” are surrounded with their more upbeat brothers so there is hardly a letdown… almost. The album sags right at the midway point when “Song Sung Blue”, “You Don’t Bring Me Flowers” and “Hello Again” take some of the air out. After that, the album is a bit hit and miss and isn’t fully redeemed until the one two punch of “Kentucky Woman” followed by “Shilo”. Back in the 90s, the movie Pulp Fiction suddenly made Neil Diamond cool again. Brooklyn born Diamond is so beloved that there is not even a sniff of irony in Boston fans singing “Sweet Caroline” during Red Sox home games (even if that tradition is getting a bit tiresome). While there is some schmaltziness that appears here and there, for the most part this is all well- crafted, life-affirming perfection.